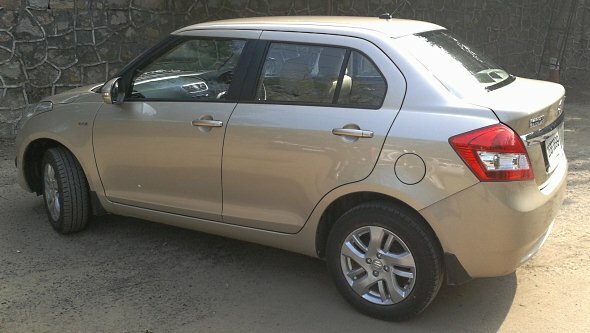 Today, Maruti Suzuki launched the 2012 Dzire compact sedan in the price range of Rs. 4.79 lakh – Rs.7.09 Lakh. The new Dzire has an ARAI-certified mileage of 19.1 kmpl for petrol variants and 23.4 kmpl for diesel variants. The new Dzire is around Rs.25,000 cheaper than the outgoing model. The 2012 Maruti Suzuki Dzire sedan measures less than four meters and thus enjoys small car duty sops and hence, is priced competitively. However, the entire tax benefits are not passed on to the consumers because, the new Dzire gets many features. The new Suzuki Dzire is available in six colors namely: blue, grey, white, beige, red and black. The 2012 Dzire is offered in seven variants which includes four petrol variants namely, Lxi, Vxi, Vxi AT, Zxi and three diesel variants, Ldi, Vdi and Zdi. The Maruti Suzuki Dzire is powered by the same 1.2-litre K-series petrol motor and the 1.3-litre diesel motor that powers the Swift. The Dzire acceleration matches with the Swift hatchback. Since the rear overhang is short in the new Dzire, it handles better than the outgoing Dzire. During our test runs, we found extremely positive feedback from the electronic power steering system and the gear shift felt slick and easy to engage. Sound damping is good and you hardly hear engine noise filtering into the cabin during normal driving. You only get a bit of diesel drone at high rpm. The new Dzire has a claimed mileage of 19.1 kmpl for the manual petrol version, 17.4 kmpl for the automatic version and 23.4 kmpl for the diesel version. The base variant of the Maruti Dzire gets electrical power steering with tilt function and manual AC. The mid variant gets power windows, central locking, rear seat centre armrest, electrically adjustable ORVMs, ORVM mounted side turn indicator, front and rear fog lamps, Radio/CD/USB music system, four speakers and two tweeters. The top-end variant has all the features of the mid variant and in addition gets Driver and front passenger airbags, ABS with Brake Assist and EBD, steering wheel mounted audio controls, automatic climate control, driver seat height adjuster and rear defogger. The Maruti Suzuki Dzire will take on the Tata Indigo eCS compact sedan. Both the cars are under four meters and gain excise benefits. In simple terms, the Dzire and the Indigo eCS are the sedan that one can buy at the price of a hatchback. Performance wise, the Dzire takes the lead for its refined 1.3-litre diesel motor puts out 75 bhp of power and 190 Nm of torque whereas the Indigo eCS is powered by 1.4-litre motor that puts out 68 bhp of power and 140 Nm of torque. Similarly, among the petrol variants too, the Dzire with its 1.2-litre, 87 bhp engine performs significantly better than the 1.2-litre, 63 bhp motor in the Indigo eCS. The Dzire has minimum turbo lag which is quite useful for city driving conditions while the turbo in the Indigo eCS kicks in only after 2,000 rpm making it a bit difficult to drive in city traffic. The gear shift action, ergonomics and overall driving experience is better in the Dzire than in the Indigo eCS. Features wise, the Dzire has an edge for it comes with features such as ABS Airbags, steering mounted audio controls and speed-sensing door locks which are not offered in the Indigo eCS. With regard to space and comfort, the Indigo eCS has an edge over the Dzire. The rear legroom in Indigo eCS is more than adequate and can comfortable accommodate three passengers. On the other hand, the Dzire has limited legroom for rear passengers and best suited for just two. The luggage space in the Indigo eCS has 380 litres while the new Dzire offers 316 litres. With regard to price, the Indigo eCS is more affordable than the Dzire. Among the diesel variants, the base variant of Indigo eCS is roughly Rs. 60,000 cheaper than the base variant of Dzire. Similarly, the mid and top-end variants of Indigo eCS are Rs 90,000 and Rs. 1.30 lakh cheaper than the Dzire. The new Dzire is an attractive package for buyers looking for a compact sedan. Though the Indigo eCS is the only competition in the market today, the Dzire has to compete with the upcoming models such as the Tata Manza compact and the Mahindra Verito compact to be launched in the coming months.